The New Game Changers was honored with the Silver Award from the 2016 Axiom Business Book Awards in the Business Fable category. The New Game Changers has been nominated as a finalist in the Leadership Book of the Year 2016 competition. In the first round of voting (from February 1 until February 15), all managers across the globe can vote online here. Whether your company is regionally focused or global in nature, your challenge is the same: frontline workers in critical positions must perform consistently at or above standards if you hope to win in today’s complex business environment. If you want to leapfrog the competition, you need to build a leadership team and a workforce focused on the things that actually produce results. When this focus is lacking, chaos reigns as good people are left to their own devices to sort out how to be successful on an ever-changing and demanding front line. And the challenge faced by new hires can be overwhelming–so overwhelming that they either quit in frustration, citing a lack of clarity in the job, or worse, stay and simply muddle through. Left unaddressed, this situation undermines organizational performance–leaving it fragmented, inconsistent, and lacking any hope of driving the desired results. This creates a trail of dire consequences, ranging from lost sales to expensive rework to huge fines for regulatory violations. Our approach to addressing this situation is based on thirty years of trial and error, on the research and practices of a small group of individuals who have been committed to improving the performance of the front line, and on, quite frankly, years of asking the wrong questions, such as, “What do people need to know?” “How do I engage the learners?” and “How do I modernize and mobilize my learning programs?” These are not bad questions, but they have not yielded the answers that really matter. What specific outcomes do I want my frontline performers to produce? 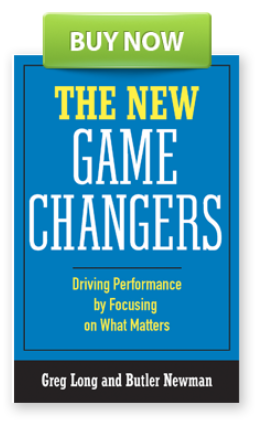 The New Game Changers: Driving Performance by Focusing on What Matters addresses this question. The answer is based on a shift of perspective: a small but significant quarter turn in thinking on how to describe and focus the development of frontline performers. We call this approach Outcomes Thinking. For more information about how to improve the performance of your front line people, please contact us at author@longandnewman.com.